What We Will Sell: Quality Appropriate Seasonal Clothing (Spring/ Summer clothing for Spring Sale; Fall/Winter clothing for Fall Sale) in Sizes Infant – teen/Jr. sizes, Shoes, Current Style Maternity, Toys, Games, Books, Bikes, Baby Equipment and Strollers. We will now accept CAR SEATS that expiration dates have not expired and car seats that have never been in an accident, “Pack’n Play” portable play yards manufactured after 2003, playpens(with top rails that automatically lock into place when setting up the playpen), and convertible cribs (NO drop side cribs will be accepted!) Consignors please check http://www.cpsc.gov for specific product recalls. Thank you! What We Will Not Sell: children’s jewelry, stuffed animals, and any toys, clothes or equipment that have been recalled due to lead paint or safety concerns. Please note: Per consignor there is a limit of 150 items; Ten maternity garments, five pairs of shoes and only NEW underwear still in package will be accepted. Sellers receive 60% of the sales price! 1. Sort all clothes by size and gender, and place on hangers. Clothes should be clean and pressed with no stains, missing buttons, broken zippers, or rips. **Skirts and pants should be safety pinned to the top of wire hangers (see illustration) – no straight pins or clothespins, please. We reserve the right to withdraw out-of-season or merchandise in disrepair. 2. Place shoes in Ziploc bags (one pair per bag), and place ONE tag (taped on three sides of the tag) to the outside of the bag. 3. Toys and baby equipment should be clean and in good working order with all parts included and secured. ****Please be sure to check for recalls on equipment/toys. **** Small items may be grouped in clear Ziploc bags (i.e. Diaper covers, small toys, etc.) Wrap large toys with plastic cling wrap or they will receive experimentation by young shoppers!! 4. ALL ITEMS MUST BE CORRECTLY PRICED AND TAGGED PRIOR TO DELIVERY. You set your own prices; prices must be evenly divisible by two (2). Contact preschool office or church office for tags (50/$1). These tags MUST be used, and are sold at no profit to us. On your tag, indicate your consignor number (first initial of first name and first initial of last name, and last four digits of your phone number), size, description, and price as noted on the example. SAFETY PIN the tag to the garment THROUGH THE LOOPED STRING, not through the tag. 5. 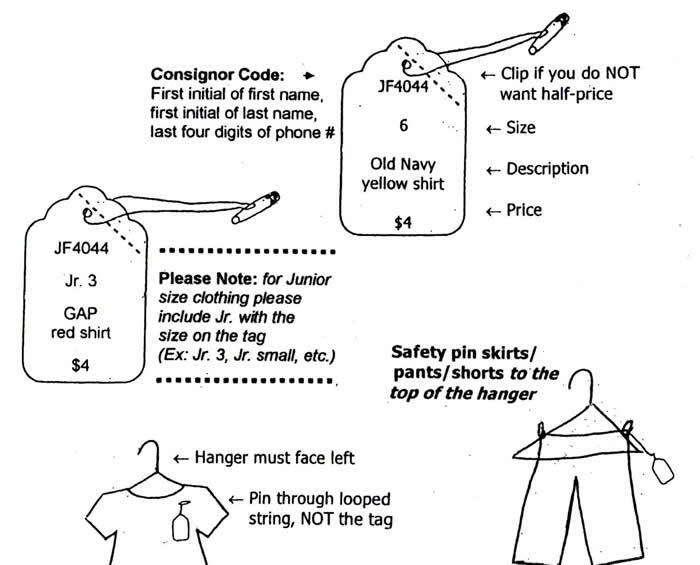 Use a safety pin to secure the tag to the upper right hand side of the garment, hanger facing LEFT as noted. BEFORE, drop off, please sort all hanging items by gender and size. 6. Place one tag (taped on three sides of the tag) on each toy, piece of equipment, shoe bag, etc. Clear tape only – no masking tape please! 7. If you DO NOT want your items reduced for the half-price sale, clip the upper right hand corner of the tag.